Alan Wilkinson. Photo by Tim Owen. As if there weren’t enough marquee concerts and club gigs staged during the festival period, the organisers also schedule plenty of free music events, and many of them are well worth checking out. The participation of the Norwegian saxophonist (and ECM recording artist) Trygve Seim at this one caught my eye. Before Seim played with the Finnish-Norwegian trio Kuára, Black Motor opened proceedings with a set of coolly improvised chamber jazz that evidently drew inspiration from Finnish folk. Although the prodigiously bearded saxophonist Sami Sippola would look the part in ZZ Top, I found it hard to envisage how Black Motor’s past collaborations with Peter Brötzmann and Raoul Björkenheim might have panned out. On one piece, Sippola played with the grizzly pungency of Archie Shepp in his prime, but mostly Black Motor music has the cool opacity of a moonlit tarn. Black Motor’s double bassist Ville Rauhala also plays with Rakka, a quartet that also invited Black Motor’s percussionist Simo Laihonen to sit in for the more rhythmically forceful material that made the most favourable impact. Elsewhere they shuck off any semblance of coolness in favour of a (hopefully) tongue-in-cheek Soviet-era hotel nightclub band vibe (or, as Radio 3 DJ Fiona Talkington put it in her introduction, an “old dance hall music” influence. Trygve Seim trumps Sippola’s facial hair display with a plaited beard and chin-length moustaches, but there’s nothing ostentatious about the music he makes with his partners in Kuára – pianist Samuli Mikkonen and drummer Markku Ounaskari (Seim here replacing Per Jørgensen, who played trumpet and sang in wordless vocalese on Kuára’s 2009 ECM album, Psalms and Places). Kuára play enigmatic music inspired by the spiritual aspects of Baltic folk customs – a music with the potency of liturgy, played with improvisational immediacy. Kuára managed the almost impossible, holding their audience rapt even in the unprepossessing environment of the Barbican Centre’s cavernous public atrium. It was a shame I couldn’t stay on, to hear Anna-Mari Kähärän Orkesteri, but I had to be elsewhere. Akode‘s bassist Ola Høyer and drummer Dag Erik Knedal Andersen both play with a kinetic intensity and intelligence that’s almost graceful compared to the more bodily emphatic style often adopted by free jazz rhythmatists. I imagine they could push less seasoned players to extremes, but British saxophonist Alan Wilkinson is too well-blooded for that. He still plays with the raw machismo that made his early concerts with ‘punk jazz’ trio Hession/Wilkinson/Fell so viscerally dynamic, but these days his baritone playing is as incisive as it is brawny, and on alto he’s more lyrical while still exhibiting a no-nonsense virility. Guitarist Kim Johannesen is a terrific foil for Wilkinson, playing sometimes in a punked harmolodic style – influenced, perhaps, by James ‘Blood’ Ulmer – more often with the raw fluidity of early Joe Morris. He’s not quite in that league yet, but well on the way to developing a unique style. The ferocity of this quartet would suit an outsider-rock context as well as it does improv, but there’s nothing so derivative about AKODE, which operates with Spartan discipline and conviction. The group was formerly known as Wilkinson’s ‘Norwegian’ quartet, but with the partnership now two years old, the group name confers equal standing to Johannesen, Høyer, and Andersen, and hopefully suggests that here’s a group with longevity. 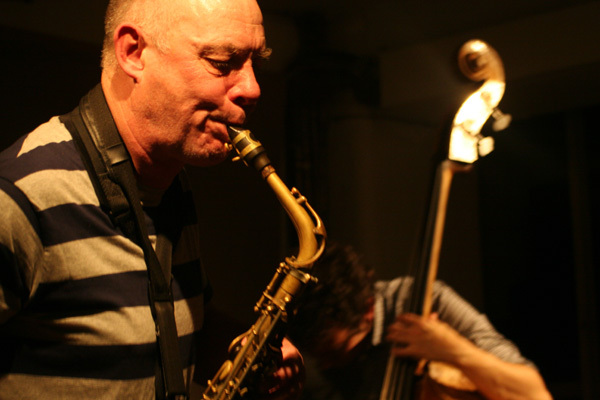 This entry was posted in Live and tagged Akode, Alan Wilkinson, Black Motor, Cafe Oto, Kuara, London Jazz Festival, Rakka, Trygve Seim. Bookmark the permalink.